(11:23 a.m. EST) -- Caribbean Princess set a milestone for Panama Canal cruise sailings recently, becoming the first mega cruise ship to travel through the expanded "Panamax" locks. The old Panama Canal locks had limits on the size that cruise ships could be; the maximum width for vessels entering the canal was 106 feet. The new locks opened in June 2016. In April 2017, Disney Wonder became the first passenger cruise ship to use the expanded locks. But while that provides bragging rights on its own, that ship was small enough to use the old locks. 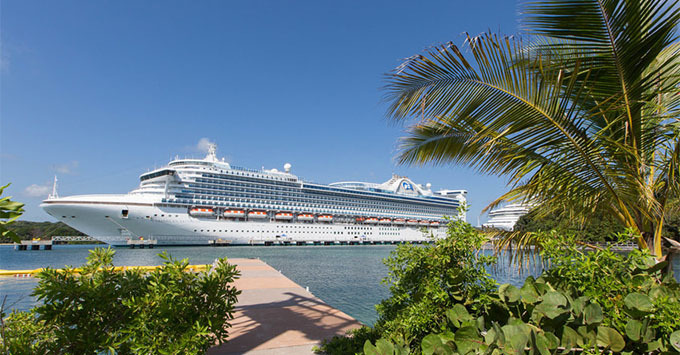 What makes Caribbean Princess's transit noteworthy is that its 118 feet wide and carries 3,200 passengers. Princess Cruises is touting the event, which happened on October 26, as part of the line's history with the Panama Canal; it was the first cruise line to take passengers through the original canal in 1967. "Marking our 50th anniversary taking guests to the Panama Canal in 2017 is a huge milestone so it's equally thrilling that we will also observed the occasion by being the first cruise line to sail a mega-ship through the newly expanded locks," said Jan Swartz, Princess Cruises and Carnival Australia group president. Caribbean Princess underwent a renovation in spring 2017 that added new restaurants and other spaces; it's also one of the line's ships that will get the Ocean Medallion technology in March 2018. The ship will make 13 scheduled Panama Canal crossings in its 2017-2018 season. Princess sails three different Panama Canal itineraries with its fleet -- roundtrip from the East Coast with 10-night sailings; roundtrip from the West Coast with 19 night sailings; or full 15-night transits.